The banter continues between some of Australia’s leading media, and in the next few months the “chatter” will no doubt vibrate into the housing markets as the voices of those wanting there opinion heard drones out common sense. So what’s the reality amongst all the shouting at time when news is scarce coming up to Christmas and we sit back and relax to 2014 ? Usually the news is scarce but we sell to a papers “Extra Extra read all about it ! (read we need negative headlines to sell papers and” any news that’s bad news when there is little news is better than no news”). Well it was the case of another day another opinion – and once we awake to the headlines in the last two days we have differing opinions. Interest rate :which way ? Financial markets now see a 60pc probability of the cash rate being the same or higher through to May next year. There is a fly in the ointment with a stubbornly high $A, which has climbed in the past three months against the $US by more than any of its peers. This less than 24 hours after driving through Townsville streets listening to the radio where the news mentioned the latest RBA statement indicating that the RBA has room to move interest rates down and there may (and that’s MAY not WILL) be a cut in January. 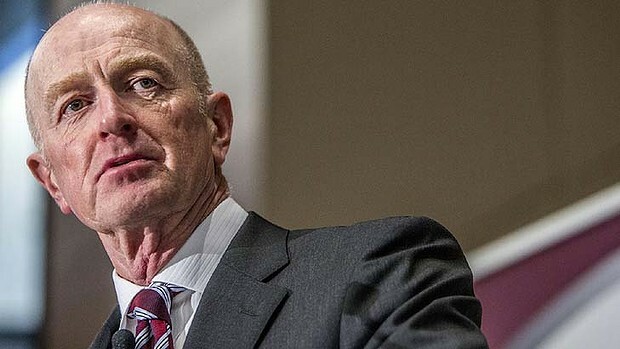 The Reserve Bank of Australia says there is growing evidence that record-low interest rates are spurring growth outside of mining, but has left open the door to further cuts because of the ‘uncomfortably high’ dollar. So why the differing opinions? Well clearly lower interest rates are starting to stimulate the housing market. Melbourne and Sydney as we know are moving again – Sydney auction clearances still at 80% – Melbourne a little patchy. Townsville Real Estate market – more buyers with confidence – language positive – making offers – but prices static. Australian dollar higher that the RBA likes – indicating room to move interest rates down rates. BIRTHDAYS are always a good time to reflect. On December 12, it will be time to celebrate 30 years since the Hawke and Keating government floated the Australian dollar. OECD report says mining boom continuing to retract – any Government tightening (New liberal Government has a green light to cut public service jobs and curtail spending to bring the reign budget deficit in likely to stymie growth – with forecast for Australian Economy to grow next year by. As a result, the federal government should shun further budget cuts “above those already factored in”, effectively delivering the Coalition a green light to slow its promised return to surplus by 2016/17. “The economy is still in a transition phase,” away from resources investment, the organisation said in the report released in Paris late on Tuesday. “Mining investment has slowed, fewer jobs are being created in this sector, and the terms of trade have deteriorated,” it said. While that was being partly offset by improved exports from the mining sector and the 10 per cent decline in the dollar during the third quarter from a year earlier, credit growth remains weak. It concludes the Reserve Bank will need to “maintain an accommodating monetary policy” to support growth. GDP growth is expected to recover only gradually in the next financial year as commodity prices fall and resources investment slows, before accelerating to 3.1 per cent in 2015. It says an increasing push by firms to boost productivity as the mining boom ends will result in “modest” employment growth. At least 300 people are set to lose their jobs as global energy giant BP cuts costs at its Australian business because the market had over the past few years become uncompetitive. And more concerns about house prices (again Sydney and Melbourne property prices). A second source of potential weakness identified by the OECD report is the fact Australia has experienced the fourth-highest house price growth of any OECD member. In findings that will reignite concern Australia’s record low official interest rates may be sowing the seeds of a property bubble, the OECD finds real house prices gained 79.4 per cent between the start of the millennium and the end of June. Only New Zealand, Norway and Canada experienced higher rates of growth among OECD members. So what’s the Lynham take on things? The Australian Economy is ship. We have sailed through the edge of a storm (GFC) narrowly missing the eye. We spent a bit of money strengthening the hull (stimulus – baby bonus’s and government cash grants via low income earners directly sent to Gerry Harvey and David Jones and J B Hi Fi) – may not have needed to but that easy to say in hindsight. The ships in clear water. The hull’s intact. We had a crew change – through a few overboard – sharks didn’t get a chance – the guy in the life raft (Shorten) watched as the crew cannibalised each other (Gillard and Rudd). The wind’s are low and we need to go back to do what we have usually had to do before work hard. And in the engine room the motors are doing there job and they have some fuel in reserve to use (interest rates) if the whether gets rough. The Captain (Abbott ) reminds the crew we need run lean (public service cuts in Canberra – spending cuts for the rest of us in the regional area’s). The guys in the first class cabins whinge and moan there’s no extra bacon but they slept through the rough waters and most came out unscathed. The engineer (Stevens’) looks like the strain is starting to tell – he’s aged – but no signs of retiring. We are now in a state of normalcy – markets will move up and down, houses will sell and in the highly populated desirable area’s of Australia (read where the new Australians want to settle) house prices will rise. We are on an even keel. The future is good – the boom is over and the only certainty is the worst is also over but we know we are going – we are making good speed with a little caution. What’s this mean for interest rates in my opinion – steady as we go Engineer Steven’s. Keep and eye on the horizon Captain Abbott and watch the radar for the little blip out to the right (retail sales during Christmas festive season). That will tell the true story as we sail closer (inflation). I believe we won’t we see to much upward pressure in the next 2 years and if the fixed rates rise so will the Bank profits as they increase lending margins again . And the hard truth – if you can’t absorb .50% increase in your mortgage, then sell the home. Better still quit smoking, drink a little less or buy less take away – it will save you more than the minor increase in rates will cost you each week and you may live a little longer to enjoy the best country on earth !